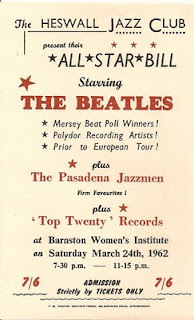 Liverpool Beatles Auction: Heswall Jazz Club Handbill. Handbills were things that were often thrown away. They were produced to promote and event and after that served no purpose so most people would simply dump them in a bin. This makes handbills rather collectible. 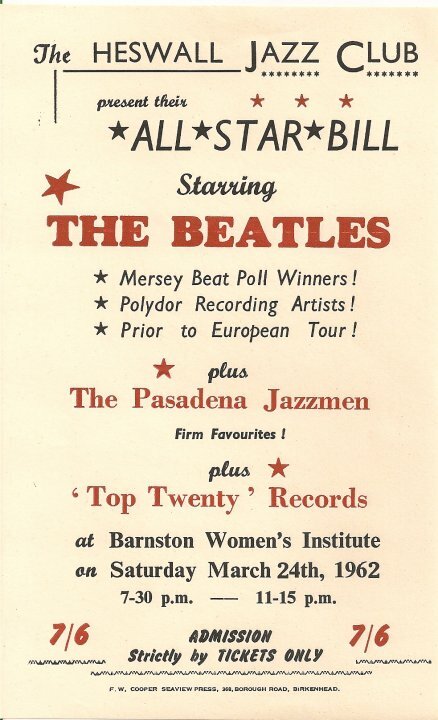 This handbill for the The Heswall Jazz Club at Barnston Women's Institute is for a concert on March 24th 1962. As you can see it's prior to the band signing with EMI, referring to the fact that they had had a record released on the Polydor label. This handbill was kept by one of the promoters of the gig, and is probably as close to mint condition as you are likely to find such an item.